After buying an otg (oven toaster and grill) the first thing that most beginners want to know is how to use it. As some otg manuals do not come with a recipe book, using an otg for the first time appears difficult. To ease out this problem, I have given a brief introduction on how to use an OTG and also a few recipes. Even though there are several brands available, the basic designs and accessories that come with an otg are similar. Hence you can compare the information given below with your brand of otg. Since we use a Prestige otg, (and are quite happy with it) the information given here is related to it. The first thing to do after buying your otg is to read the manual completely. This will give you a brief idea about how to operate it, clean it, the precautions to be followed, the accessories provided, and other basic information. An otg is usually provided with 3 shelves or racks and 3 knobs to adjust the temperature, heating positions and time. • Temperature control knob - To adjust the temperature of the oven. The maximum temperature that can be set is 250 degrees Celsius. 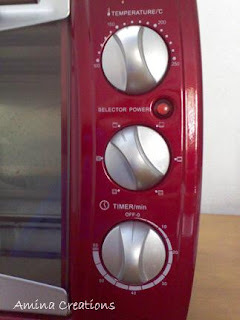 • Function knob- There are usually 4 heating rods provided in an otg, two above and two below. (Some small sized otgs have 2 rods). The function knob is used to select one from the 6 heating options. They are upper heating, lower heating, both upper and lower heating, rotisserie with upper heating, rotisserie with lower heating and rotisserie with both upper and lower heating. • Time control knob – The time control knob is used for setting the time. The time can be set according to the dish that you are making. E.g. while cakes take 25 to 35 minutes to bake, cookies can be baked in about 15 to 20 minutes or less. The maximum time that can be set in most ovens is 60 minutes. The regular accessories provided with an otg are a baking tray, a grill rack, a crumb tray, a tray handle, 4 skewers, a rotisserie spit and a rotisserie handle. 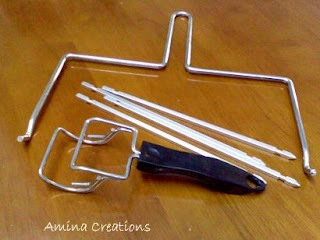 This can be used for cooking or roasting fish, chicken, vegetables, etc and preparing pizzas, pita bread and puffs. 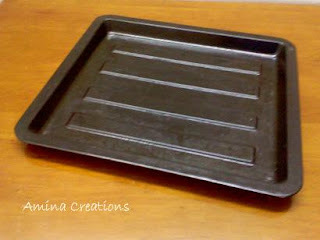 You can also use this tray for heating food. Another vital use of this tray is that you can place it in the bottom rack of the oven when you are grilling chicken or vegetables in the middle rack or while using the rotisserie mode to cook Tikkas and kababs. This will help in preventing juices from the chicken from falling on the heating rods below. This is usually placed at the very bottom of the oven to collect any crumbs or pieces that may fall off during a baking or grilling process. It can be removed and cleaned. Cake pans, cookie trays, muffin moulds can be placed over the grill rack or large slices of chicken, fish, etc can also be grilled by directly placing them over it. Alternately, the grill rack can be turned upside down so that skewers can be placed over it to grill kababs, chicken, paneer, etc. The rotisserie spit is a long rod which is used to grill whole chicken or make tikkas and kababs ala Tandoori style. The USP is that it rotates and hence the food is evenly cooked on all sides. This is used to remove the hot grill rack and baking tray from the oven. The skewers can be used to prepare kababs, tikkas, grill small pieces of chicken or cubes of paneer and vegetables. During the grilling process, the skewers have to be turned once in a while to ensure uniform cooking. After using the rotisserie spit for grilling, the hot rod can be removed from the oven using this handle. With the given accessories, you can make puffs, pizzas, and grill or roast chicken and vegetables but to bake cakes, cookies, etc there are some cake pans and moulds that are necessary to be bought. 1. Cake pans, preferably aluminium cake pans to make cakes and brownies. 3. An aluminium tray to make cookies. Even though the baking tray can be used for this purpose, an aluminium tray is best suited for baking cookies. Before baking or grilling anything, preheating the oven is a must. The oven has to be preheated for at least 10 minutes. Even though any of the three racks can be used, we always prefer to use the central rack of the otg with both the upper and lower rods ON as it provides uniform temperature and aids in even cooking. Placing the tray in the lower rack might result in burnt up cakes if you do not adjust the correct time and temperature while placing it on top will result in a roasted effect on top with the inner side not being cooked. Hence for beginners it is better if you play it safe as you do not want a disaster in your first experience with baking. The temperature depends on the size of the oven and brand; it is only with practice that we can gauge the correct temp of our oven. It took us several burnt cakes and biscuits to come up with this list. It works best for our Prestige Otg and might work for yours as well. For baking, roasting and grilling we always use the central rack of our oven and use both the upper and lower rods to get uniform temperature. 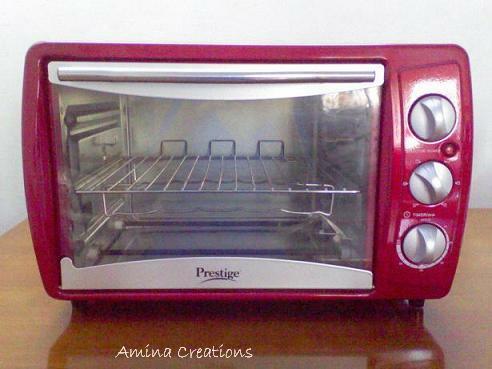 Take care while setting up the time and temp for the oven as it varies from oven to oven. Always keep a close watch when you are making it for the first time. Always use a thick hand glove and do not touch the surface of the oven as you can easily get burns if you do not handle your trays and cake pans with caution. This is just a brief outline, more information on how to use an otg oven will be added soon. I have tried my best to give clear information, but I am not an expert in this. Hence it is advised to always use your discretion while following the information provided here and while trying out any of the recipes mentioned below. For more recipes of cakes, biscuits, cookies, pizzas, etc that can be cooked in an Otg, visit OTG recipes page.